The Truth About The Hospital "Freebies"
Help Ban The Bags! Support Breastfeeding From The Start! The benefits of breast milk are well known, and national health programs encourage mothers to nurse infants rather than feed them formula from bottles. But some hospitals actually undermine efforts to encourage breastfeeding by including free formula in the care packages they give mothers and babies as they leave the hospital, according to a study in The American Journal of Public Health. Researchers surveyed about 3,900 Oregon women who had babies in 2000 and 2001. Among those who were breastfeeding when they left the hospital, more than two-thirds said they had received hospital care packages containing formula. 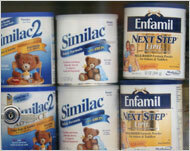 But the care packages had a dramatic impact on patterns of breastfeeding. Women who received the packs were 39 percent more likely to stop exclusive breastfeeding at 10 weeks or sooner than those who didn’t receive free formula, according to the report. According to data from the Centers for Disease Control and Prevention, although about 74 percent of American women try breastfeeding, only 11 percent end up breastfeeding exclusively for at least six months. JUST SAY "NO THANK YOU!!" This is NOT a "Free Gift". This is nothing more than a sneaky, underhanded, formula company marketing tool, and a VERY successful one at that! 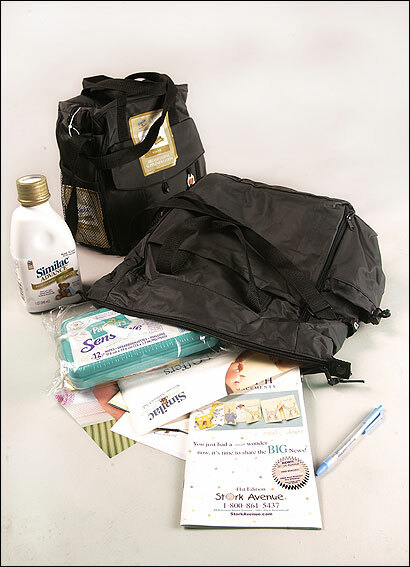 Even the "Breastfeeding Support Bag" has a formula sample included! Do yourself and your new baby a favor, Leave that "Free Gift" on your hospital bed when you head home! Click Here To Read About The Free Hospital Pacifiers!